Robert Dean hugs a student before leaving the Dean International flight school on Monday, July 23, 2018. Dean announced that the school is closing down after two of its planes collided over the Everglades last week, killing four people. Dean International — the Miami-Dade flight school that owns the planes involved in last week’s deadly midair crash over the Everglades — has shut down, company officials confirmed Monday. 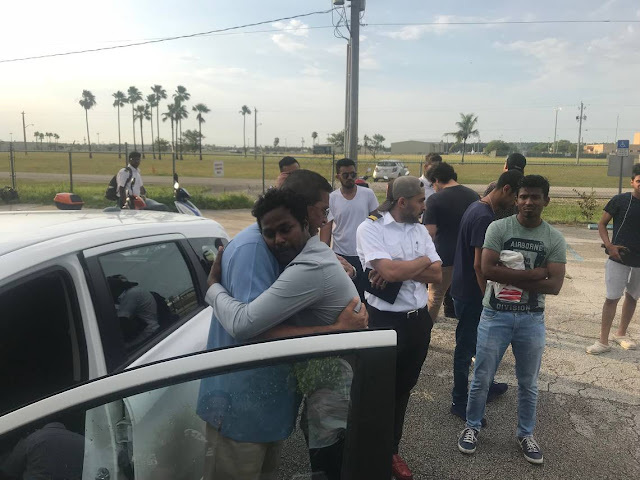 Staff broke the news to students following a brief memorial at the Kendall flight school for the four people killed: Jorge Sanchez, 22; Ralph Knight, 72; Nisha Sejwal, 19; and Carlo Zanetti Scarpati, 22. Dean International, which operates out of Miami Executive Airport, 2800 SW 145th Ave., is home to about 200 students from nearly 100 countries. The majority of the school’s students come from Saudi Arabia, India and Latin America. As Dean spoke to the Miami Herald in the airport’s parking lot, dozens of students, who had stood for hours outside the school’s airport office demanding a tuition refund, gathered around. In the afternoon of July 17, a Piper PA-34 and a Cessna 172 — which had both departed from Miami Executive Airport — somehow crashed in the sky and plummeted into the Everglades, nine miles west of where they took off. After a frantic search, Miami-Dade police and fire rescue recovered the four bodies. Police said Knight was a subcontracted inspector who worked for the FAA and that Sejwal was on a routine flight check to maintain her certification. Sanchez was a certified flight instructor at Dean. Information on Scarpati was not immediately available. Police believe Scarpati was flying with Sanchez and that Knight and Sejwal were in the other plane. Dean told the Miami Herald one of the victims, Nisha Sejwal, had taken an aircraft out that same morning with the same examiner. “They went back up in the air later on and everything was working fine — and then nine minutes into the flight, they collided,” Dean said. Records show the school’s planes were involved in five accidents from 2007-2017, resulting in two fatalities. FAA records revealed that the flight school had 26 FAA accident/incident reports — more than two per year — since 2007. The federal National Transportation Safety Board and the FAA are investigating this recent crash. Days after the crash, the flight school’s website was hijacked by hackers. “You have killed too many students,” the site said in large capital letters. The Miami Herald spoke to dozens of students who asked not to be named because of their immigration status. They said they also feared retribution on behalf of the flight school for discussing matters with the media. Dean quickly tried to ease students’ concerns: “When I’m underground and dead, that’s the only time you’ll have a problem getting in touch with me,” he told a student pilot in uniform, then gave him a hug. “We’re just confused, stunned, sad,” said Ibrahem Khenkar, 20. MIAMI-DADE COUNTY, Fla. - Dean International, the troubled flight school that was involved in a fatal mid-air crash last week that left four people dead, has shut down, the company said Monday. 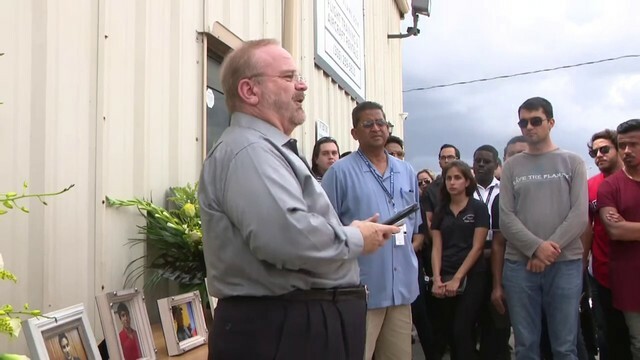 Dozens of students found out about the closure as they gathered for a memorial for the victims of Tuesday's mid-air collision at Dean International headquarters at Miami Executive Airport. 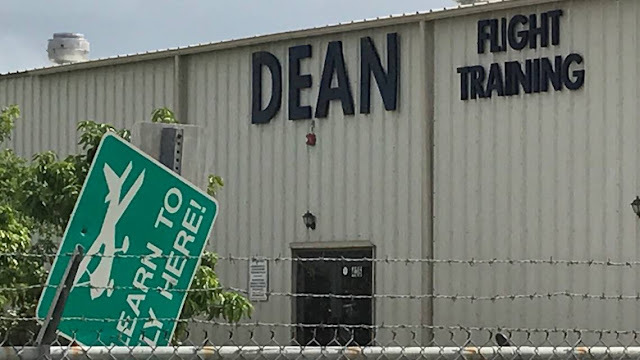 Dean International's lawyers and owners conferred Sunday and decided to shut down and liquidate the company, said Robert Dean, the flight school's owner. “We were planning on downsizing a little bit, and this took place, and there was just no way. We can’t live with ourselves to know that this took place,” Dean said. However, Dean maintained that Tuesday's crash was not the company's fault and that the planes were working properly at the time of the crash. "There was no maintenance issue. Everything was OK with these planes. They didn't see each other. ... It just happened," Dean said. He said the decision was voluntary and the Federal Aviation Administration did not order the school to shut down. The closure affects about 200 students at varying levels of completion in their training to become pilots. Between 85 and 90 percent of the students are not U.S. citizens. The foreign students are expected to have issues with visas since the school that is listed on their visas is closing. Nawaf Mojahed is from Saudi Arabia, and he had just one test left before he was a certified pilot. "I have to go to other school, but other school said you have to get a new visa because your school is closing so I don’t know what to do so I guess I’m not going to be a commercial pilot anymore,” Mojahed said. Dean said no planes would be taking off, but the school will remain open for three months to allow students to transition to other flight schools. Students protested the move and have demanded their tuition be refunded. The students said the decision to shutter the school took them by surprise. "What are we going to do now? Nothing!" student Basil Aladwani said. Carlos Alfredo Zanetti, 22, Jorge Sanchez, 22, Ralph Knight, 72, and Nisha Sejwal, 19, were killed Tuesday when their planes crashed near the border to the Everglades, police said. The FAA said the planes involved in the crash were a Piper PA-34 and a Cessna 172. The same flight school was also involved in another crash over the Everglades in May. Two people suffered serious injuries in that crash. In 2017, Dean International student Mark Ukaere was killed when he took a small plane for a flight without permission. He was supposed to be flying with an instructor, but his girlfriend, Mercy Akinyemi, who lives in New Jersey, said he told her the instructor never showed up. In the last 10 years, records show there have been at least 24 incidents involving the school that required investigation. The National Transportation Safety Board is currently investigating last week's crashes.